Following our note to the congregation in October, Keith Keiling and David Schneck have formed “Forged in Wood” to implement the program of creating useful and decorative items from our Historic White Oak Tree. 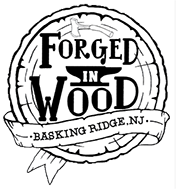 Work is already underway to process the wood; “Forged in Wood” is excited to announce that a showing of their efforts will take place this coming Saturday afternoon at the Basking Ridge Business Alliance Winter Market on South Finley Ave. The Winter Market is held in conjunction with the traditional Christmas tree lighting in front of the Basking Ridge Presbyterian Church. “Forged in Wood” has selected The Rebecca Collection on Olcott Square in Bernardsville as the exclusive retailer of their products. Items crafted from the Oak Tree will be available beginning this Friday November 30th. “Forged in Wood” has also completed custom Oak Tree benches for the Tree House learning garden adjacent to the Little Acorns building. This special addition to the garden will be dedicated on Friday morning November 30th. As a reminder, our agreement specifies that 10% of all revenue generated from sales will be donated to BRPC for the Oak Tree Fund. Moneys collected will be used to create a lasting memorial to our Historic Tree.